Yesterday I decided to have a day off from the blog. This made sense because it would give me a chance to see the GP again at the idiotic time (3:00pm) that Fox chose to broadcast it and so I would have a greater opportunity to reflect upon events. The strange thing is that exactly the same things happened in the later broadcast - Vettel still won and Red Bull repeated their one-two victory. Not that I was hoping for a different result; the Red Bull RB5 was clearly quicker than the Brawn BGP 001 throughout the weekend and the only chance for a decent fight between the two teams was if Barrichello managed to get the jump on Vettel at the start. Even then, the Red Bull's heavier fuel strategy meant that their two drivers would leapfrog Rubens in the first pit stop. That left Mark Webber as the only chance for a tussle at the front and Barrichello's retaining second spot put an end to that - Vettel sprinted away in the lead while Mark was held back by the Brawn. Much has been said of Adrian's Newey's updates to the RB5 being a large part of their advantage at Silverstone and I am sure there is truth in that. We should not forget that Red Bull already had the edge on Brawn at high speed tracks, however, and the tale may be different on circuits where mechanical grip is more important than aerodynamic downforce. That should mean that we will not be presented with a second half of the season in which Vettel does a Button and runs away with every race; much more likely is that the two teams will swap the advantage from race to race, providing us with knife edge contests similar to the Ferrari/McLaren battles of the last two seasons. In the meantime, Button will edge closer to the championship and almost certainly come out on top, albeit with a greatly reduced lead. That should keep everyone happy, I think. But I was supposed to be looking at the race, not the championship. For those who are only interested in the first few places it may have been a bit boring, especially after Webber emerged in second after the first pit stops. Further down the order there were some great drives and battles, however. We were even treated to a renewal of the Hamilton/Alonso rivalry, Lewis holding back the faster Renault for many laps before Fernando at last managed to get through. Felipe Massa continues to impress as the more formidable of Ferrari's driver pairing. He showed real consistency combined with pace as he made the best of his heavier fuel load and was duly rewarded with fourth place. In doing so, he passed Nico Rosberg who had been ahead until the the first stops. Williams must be wondering what they have to do to get Nico to the podium. They are on the right track, however. Their fuel strategy was much better than of late and at last they gave Nakajima a fighting chance with a lighter fuel load for qualifying. It was a bit too light, however, and Kazuki went from fourth down to eleventh in the course of his first stop. Give the guy the same fuel as Rosberg and the team will have two cars in the points, I think. Enough has been said about Button's problems at Silverstone for it to be unnecessary to add much. He was bound to have an off day sooner or later and it was just a pity that it came at the British GP. Jarno Trulli and Timo Glock did sound work to bring the Toyotas home in seventh and ninth, the car obviously happier on the fast corners of Silverstone, but the real revelation was Giancarlo Fisichella in his Force India. Tenth spot in a race with only two retirements may not sound much but, for the team, it was a huge encouragement, especially as Fizzy earned the place on merit, battling with the big boys and, at one point, passing two of them at once. The team must surely score their first points this season. McLaren had a race to forget, the MP4-24 desperately unhappy and twitching its way around the twisty bits. Lewis did his best and put on a brave show in his fight for what ended up as 16th position. And Heikki was probably relieved to be taken out by Sebastian Bourdais's botched overtaking maneuver. The BMWs were a bit better than of late, Heidfeld holding back Alonso for many laps while Kubica did the same for Hamilton. Thirteenth and fifteenth is not good enough, however, and the Beemer engineers need to burn some more midnight oil if they are to make the F1.09 anything like competitive. As for Toro Rosso, they at least provide us with the interesting spectacle of a Newey design being both the fastest and the slowest cars in the field. Some of that must be down to the drivers and it must be said that Bourdais is proving a disappointment this season. Overall, it was not a bad race, although somewhat lacking in interest for large periods. It was always going to be hard to compete with the drama of the political fight, however, and the glorious sight of Max and Bernie retreating hastily from their previous stance of no return to Silverstone whatever the circumstances. It is amazing how quickly their minds have changed now that it is clear that their toys are going to be taken away. A bit early to count Button as the Champion. He is 23 points ahead, one DNF coupled with a win by Rubens and that lead shrinks to a manageable 13 points. What is with the launch problems on the Brawn car? If it isn't Rubens, it's Jenson not getting away very well. They risk getting hit from behind and not making the first corner. The Ferrari team seems to be one of the few who have the KERS figured out and it came into good use at Silverstone. McLaren's system has always worked well and they really needed it yesterday. Did they use it? And Clive, you heard it here first a few weeks back on this very blog. Ferrari can finish 3rd in the cons. championship this year. They have pulled out back 15 points in the last 4 races from Toyota and seem to be evolving quicker with the development of their car. The trail Toyota by 7.5 with plenty of time to get past them. I'm at a loss as to why McLaren hasn't picked up more pace so far this year. All I can think of is that car REALLY is that bad. They certainly have the resources to make a better car as many other have. I am positive they know how to add down force to a car, therefore, it must be a combination of many things wrong on that car. A 3 week break will give teams plenty of time to improve their cars before the next race. Once not a fan of Silverstone in the past, I did see the reason the track is so well liked by the drivers and fans this time around. Hard to pass on, isn't it? Aracer: I'm not really counting on Button as champion this year - just that he can do it if he just keeps finishing in the points. With so little difference between points awarded for finishing positions, it is very hard to claw back a lead as big as Button's. As for the Brawn's launch problems, Ross reckons they've fixed the glitch that caused Rubens' bad starts this year. I think nerves just got to Button this time round. Apparently McLaren did not use KERS at Silverstone. It might have helped them a bit but the team has at last realized that the amount of time spent in making the car work with KERS is just not worth the time lost in fixing its aerodynamic faults. So they're accepting a few bad races in return for making the thing a bit more competitive. McLaren's difficulty with developing the car is entirely due to the ban on testing. Somehow the simulators and computers are not pinpointing the problem (which stands to reason since the car was designed on the same machines) and so the team has to use flo-vis paint in practice to see what the air is doing in reality. I would guess that there has been a slight miscalculation made somewhere in the CFD that messed up the simulations and this is multiplied when trying to fix the thing using the same methods. We have seen with Renault and Honda how an error in the computing can ruin an entire year for a team. And yes, it's very difficult to pass at Silverstone. Huge amounts of courage are needed. I for one think it will be a meltdown of historical proportions for Button not to win. Red Bull apparently isn't as good on slow corner tracks or with high temperatures. I agree with you Clive and see it as going back and forth between RB and Brawn. It will be a wash and with Button's early advantage, his championship to lose. I think RB have a better chance at the constructors as I think the two RB drivers have a better shot of pushing Barichello down the grid. Kimi is again a big dissapointment. It seems like it's time for him to go. Thought I'd never say that when I reflect on how good he was with McLaren. He just doesn't seem to have the drive anymore. I'm with you on Bourdais. This may be his last year as well. 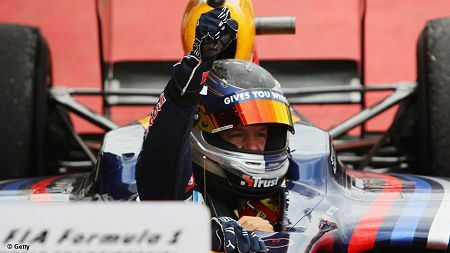 Of course I can't end this without an acknowledgement of Seb Vettel's good drive. If he can continue without making mistakes or being saddled with questionable tactics, second in the championship should be his. Frankly I think Webber is a bigger threat to him then Barichello. It was nice to see someone besides Button win a race for a change. It is sad that Button couldn't win his home race though. Silverstone has underlined one of the present problems. (Problems? F1? I've got to be kidding.) The drivers don't make much of a difference as compared to the other variables that effect a race. Despite all the monkeying about with the rules that has gone on, the end result is a failure. Silverstone is a great race track. I've seen a lot of good races there in the past (on TV). This one wasn't particularly exciting though, but that is not the fault of the track nor the drivers. When the rules defining what an F1 car are put forward, as they have been for the past decade or so, the limitations of the tracks vis-a-vis the aerodynamics of cars doesn't seem to be taken into consideration. The diffusers maybe helping the cars that are leading but, the more efficient in generating effects the diffuser is, the more turbulence there will be behind the car. Far too many races are won in the pits of in qualifying as a result of the nearly impossible task of passing. is a shadow of its former self. If I want to be awed by pure technology I'll go to an air show. Auto racing is about the fans relating to the drivers in the car, excelling, not to pre-programmed, obvious outcomes of which the talent of the driver has little or no bearing upon. I think Barrichello did an amazing job. Clearly he hasn't been able to keep up with Button this year but seemed to pull a rabbit out of the hat for this race. I will be surprised if he has many of these rabbits though. Steve: I agree that Webber is more of a threat to Vettel than Barrichello is. When the RB5 is good, Mark pushes Sebastian hard - it would have been a Red Bull front row in Silverstone had not Kimi been dreaming on Webber's quick qualifying lap. Barrichello seems to be the opposite - good when the Brawn is not so hot. Since the chances are that the car will be good more often than not, Button will continue to be the faster of the two Brawn drivers, I think. Nick: It will be interesting to see what FOTA makes of the rules if their series goes ahead. I imagine that we will take the 2009 regs as a baseline and then change things that don't cost too much if they offer hope of decreasing the influence of aerodynamics. presumably they will stick with things like no refuelling as well, although that does mean an extensive re-design of the cars to fit larger fuel tanks. Hopefully, they will not lose sight of the problem of overtaking but we can expect change in that area to be more a matter of evolution than the sudden insane revolutions favoured by Mosley. In time, I'm sure they'll get it right. Pretty much spot on, Clive. Especially the part about SeaBass. I was one of his biggest supporters, but he sure has been a disapointment this year. I'm also in complete agreement with Steve about Kimi. Just doesn't seem to have the passion. Massa scores much bigger in that department. Maybe it's a latin thing. No sense in talking about Nick, Kubica, Piquet or the rest until it becomes clearer what next year will really look like vis a vis FOTA vs FIA. I'm hardly one to stand up for Button, what with thinking he's pretty mediocre and has got very lucky this year, but the start wasn't his fault. Trulli had a poor start, and whoever was to his left boxed him in behind Trulli. "Apparently McLaren did not use KERS at Silverstone. It might have helped them a bit but the team has at last realized that the amount of time spent in making the car work with KERS is just not worth the time lost in fixing its aerodynamic faults. So they're accepting a few bad races in return for making the thing a bit more competitive." Also, if it's not being run next year, they're better off scrapping it now, and trying to learn what they can about next years car. Don: Yeah, it looks as though we were wrong about SeaBass - I thought STR would be mad to drop him for this season but he really hasn't come good at all. Interesting that Brawn said the cooler weather made it difficult to get heat into the tires. That explains why Rubens was quicker than Button; the same driving style that overheated his tires at Monaco allowed Rubens to get more heat into his tires at Silverstone. Years of studying the Schumacher style. Jenson, being smoother could not get his into the correct operating range. Speed had several shots of the back of Button's car stepping out on the last turn. Shades of Kubica and Heidfeld last year. I must agree that Seabass has been a disappointment. Maybe the Euros are right about American racing being at a lower level. Speed also made the comment during the GP2 race that those cars use a bit of ground effects rather than relying so heavily on a diffuser, and there is certainly more passing in GP2. The ground effect cars of CART also seemed easier to pass with than flat bottomed F1 cars. Something to look into perhaps? A Brazilian blogger suggested that when one looks at Barrichello career he was always at his most impressive with the harder cars. Maybe Brawn and Thiesen should swap one of their drivers. About SeaBass this seems top be the season of the underperformer driver that got his second chance, isn't it? SeaBass, Kazuki, Nelsinho even in its way Heikki. Everyone that had people calling for his head last season are not doing well. Hell, even Glock is getting beat by Trulli again, after looking better than him at the end of last season. Lonny, it's worth remember that Bourdais four Champ Car titles happened while racing to the only major team left in the series. He pretty much had to beat his team mate. I have joked a few times that Williams should just hire him if the split happens. A scary stat about McLaren: the last time they went four races without scoring Meyer still owned the team. It never happened under Dennis even during that team worst periods. As I wrote at my blog yesterday after Silverstone, Force Idia can claim that McLaren is the worst Mercedes-powered car at the moment. Lonny: Interesting thoughts. It may well be that a return to limited ground effect while cutting back on the aero is the way forward. Filipe: I can't see Rubens wanting to swap to BMW at the moment! Plus he is obviously worth quite a bit to Brawn in that he comes good when Button doesn't. It's the ideal situation from a team point of view. I would argue the point about Kazuki not doing well this year. When given the chance, he is as quick as Rosberg. And it was quite amuzing to see pictures of Dave Ryan being entertained at Ferrari this weekend. Good points about Seabass' Champ Car team wins. In addition, it was basically a spec car series at that time. One only needed to have the fastest chassis, which can be the engineers expertise. His team was far and away the best with the best notes and the best engineers. Every driver on that team went blindingly fast.....Mansell, De Matta, Andretti, Tracy, Wilson, Bourdais, Fittapaldi, Junquira, etc. They are all talented in their own right, but given the best car....they should win! In F1 this year, the driver must develop a individual car along with the engineers with no established baseline to work from. McLaren....they should have run KERS. They need every 0.10 of a sec. they can get and their KERS was reliable. Also, they may not be able to test as much this year. But, the playing field is level for all teams. Red Bull, Ferrari, Force India have all improved their cars in a measurable manner. McLaren doesn't seem to be developing as fast. Maybe Clive is right...Ron is the man @ McLaren! Regarding Buttons start. If you watch the replay carefully it is clear that Button does indeed get a good start, however the car in front of him (can't quite remember who it was) got a poor start and Button found himself boxed in. This is where drivers like Hamilton and Alonso would simply force their way past but Button as good as I think he is, in my opinion is lacking in this type of racecraft. I think Maclarens problem is that the depth of change in the new regulations have been quite a leveler this year and all the cars are quite close in performance. This means that although the car is bad and near the back of the grid it is still not as far off the front pace as the rear enders were last year. The leaders last year would often lap almost the entire field in every race and I seem to remember some being double lapped. At silverstone everyone that finished in the top 11 were on the same lap and at Turkey it was the top 13. So I think what looks like a very desperate statistic is in fact not as bad as it looks and is more bad luck that they are experiencing this poor form at a time when the field is as close as it has been for some time.